Monolithic Silica Column for LC | SnG Inc. 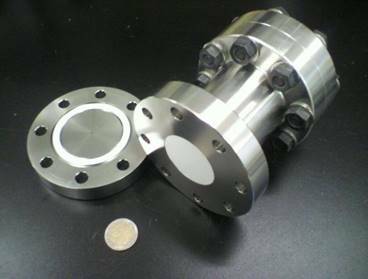 The monolithic silica column is a column for liquid chromatography that filled large monolithic silica directly into high pressure resistant stainless steel tube. 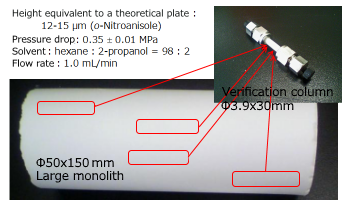 The low column pressure produced by the characteristic mesh-like structure and the high responsiveness brought by a compact frame comparable to the particle size of the nanoparticle filler for UHPLC provide very high column performance in methods of gradient separation and high speed processing. Columns made from large monolithic silica with no cracks provide columns with a dense and homogeneous mesh-like structure and stable quality. Because of its homogeneity, columns made from large monolithc silica demonstrates the same performance regardless of which part is used. Since analytical/preparative columns are manufactured using the same large monolithic silica, that made method transfer accompanying scaling up from analysis to preparative column smooth. The monolithic silica column is cartridge type with column end removable as standard specification. Column cost can be reduced because complete column exchange only by removing the dedicated column end from the column body then installing the cartridge after column deterioration. For monolithic silica, there is no worry about column deterioration because its filler has a continuous mesh-like skeleton, packing density does not change at all due to drying or impact. Therefore, we can sold only with cartridges. There is no leakage of filler from the cartridge, and there is no degradation even when solvent is exhausted.